Exciting new blackjack variants are now available at G’day online casino, and each feature unique side bets. A few months back we saw the addition of the innovative software developer Felt Gaming to Leo Vegas online casino and now the Aussie themed Internet casino has incorporated Felt’s games into their catalogue. These games include an array of real money 21 titles with special side bets and high quality design. The graphics are unique and new players can take advantage of the handy gameplay tutorials available. Blackjack with Perfect Pairs Bet: The side bet option with a win if the first two cards are a pair – payouts up to 25:1. Blackjack with 21+3 Bet: The side bet option with a win if the first two cards and the dealer’s up card create a Three Card Poker hand – payouts of up to 100:1. Blackjack Suit ‘Em Up: – The side bet option with a win if the first two cards are the same suit – payouts up to 50:1. Blackjack with Buster Bet: The side bet option with a win if you pick the dealer will bust – payouts up to 2000:1. Blackjack with Lucky Ladies Bet: The side bet option with a win if the first two cards create specified combinations – payouts up to 100:1. 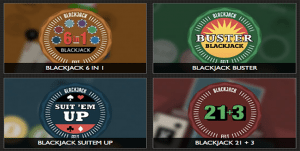 Blackjack with Lucky Lucky Bet: The side bet option with a win if the first two cards and the dealer’s up card equal 19, 20, or 21 – payouts up to 200:1. Blackjack with 6 in 1 Bets: The side bet option of putting one right up to six of the side bets mentioned above – payouts are as detailed above. Additionally, players can access the games on their smartphones and tablets, as well as desktops and laptops, with the option of single player or multi-player. Felt Gaming established in 2013 with a vision of developing online casino games which mirror titles in North American and European land-based casinos. These elements can be seen in the unique side bet additions, all easily accessed via the convenient layout. The company also offers a range of other table games including poker and roulette. Head on over to GDayCasino.com now to try these unique real money 21 additions on your desktop or portable device.